CLIMB stands for Challenge. Learn. Inspire. Master. Believe. Throughout our Oahu zipline tour, you’ll learn to believe in yourself. Whatever fears you have when the day starts will be overcome by the end of the day. Afraid of heights? We’ll help you face your fear in a safe and controlled environment! Our experienced guides are with you every step of the way to help you gain self-confidence and overcome any challenge. Once you’ve conquered the challenge, you’ll have a newfound confidence in yourself that will inspire you to try other exciting adventures in the future. Our Oahu zipline tour is not just fun — it’s educational! Along the tour, you’ll learn more about Hawaii history, culture, and farming. We’ve set up a number of educational exhibits along the way that teach you how Hawaii has changed over the years and change the way you look at it. We walk you all the way through Historic Hawaii, to the Plantation Era, to today! You will also have the opportunity to explore a working farm and learn more about it. But, that’s not all! You will get to taste fresh fruit from the farm, like apple bananas and cherry tomatoes. One of the most important things you’ll gain from our zipline tour is stronger friendships. When you share this experience with others, you’ll form a special bond. Ziplining is a great team-building activity! It’s guaranteed to get you talking and improve your communication with one another. You’ll also grow closer together when you overcome challenges as a group. Whether you’ve known each other for years or have just met, you’ll end the day with stronger friendships and a bond that can’t be broken. You will make plenty of long-lasting memories on our zipline tour. Experience Hawaiian culture and gorgeous views of the North Shore surrounded by your friends or family! The sights you see will be something you’ll never forget. To help you cherish the memories, we take pictures of you along the tour that you can purchase once the tour is over. A picture of you laughing with the beautiful scenery of Oahu behind you is just what you need to keep the memories close to you forever. 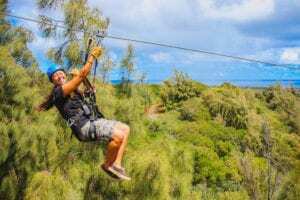 Our Oahu zipline tour is one of a kind. 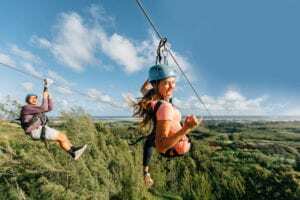 This 3-hour guided tour includes Oahu’s longest ziplines and are designed so you can see the North Shore’s famous beaches, farms, and lush mountains. You’ll have panoramic views overlooking the North Shore, offering a new perspective of its beauty. 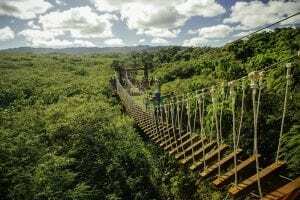 In addition to ziplines, the tour includes an ATV ride, rappels, scenic boardwalks, sky bridges, and even a few surprises! Now that you know everything our Oahu zipline tour has to offer, it’s time to visit! Learn more about our zipline requirements, then plan your adventure.